Last month I sent to all parish priests and lay pastoral leaders information stating what is to be done if there is no priest available for Sunday Mass. This is a pro-active stance if such a situation should arise in the future, and because some people have asked about the possibility of having Services of the Word with Communion. The principles to be followed in such a situation are spelled out in Canon Law and other documents of the church. On the local level, I have discussed this with my council of priests at some length. When this situation arises in the future and no priest is available for a Sunday Mass, a lay-led service could be held at which the scriptures of the day are read, a homily is delivered and Holy Communion is distributed. But this situation would be quite rare and would probably be only in the more remote areas of the archdiocese. If it is felt that there is good reason to hold a scripture and Communion service in the absence of a priest, permission must be sought from the bishop of the diocese beforehand. This means that I would have to be consulted and I in turn would need to consult my council of priests. In an emergency this may not always be possible, but it is the ideal. I have sent information out to the clergy of the diocese, but I believe that all Catholics in the archdiocese need to know what the practical underpinning principles of all this are. The following are some of the more important. The Sacrifice of the Mass is the central act of Catholic worship. It is the celebration of the death and resurrection of Christ. It is a commemoration of the great events of the Last Supper and Calvary—but it is more than that. It brings Christ among us again to be sacrificed to his father for our salvation. Bearing this in mind, it can be appreciated that the Mass is infinitely superior to any gathering of the faithful which consists of readings, homily and Communion. It is true the latter is an act of worship and so has merit, but it is not the sacrifice of the Mass. There was a remark passed by a participant at a meeting in the archdiocese some time ago when this matter was discussed. It was said, ‘Well, we can forget about priests and just hold Communion services.’ It is easy to see that this is not the correct theological or devotional path to follow. The Directory for Sunday Celebration in the Absence of a Priest (June 1988) states that ‘whenever mass cannot be celebrated on Sunday, the first thing to be ascertained is whether the faithful can go to a church in a place nearby to participate there in the eucharistic mystery (ie, Mass)’. This emphasises in another way, the superiority of the Mass as our act of worship. Another aspect of this is that in city parishes or in places where there are Catholic parishes close to each other, it would normally be difficult to see reasons for holding a service of scripture reading and Holy Communion. The more recent apostolic exhortation of Pope Benedict XVI, Sacramentum Caritatis, states that going to a church some distance away to attend Mass might demand a ‘certain sacrifice’. Most of us, including myself, would not hesitate to drive 10 km to see a worthwhile film or a rugby game. To travel this distance to attend Mass would not normally be a great sacrifice. The directory also states that services in place of Mass cannot be held if the Sunday Mass has already been celebrated in that church on that day (this would include a vigil Mass). Paragraph 21 of the directory also stipulates that only one service of this type is able to be held in each parish church on a particular Sunday. 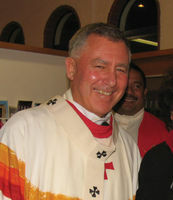 I have said to the priests that the above principles are to be observed in the Archdiocese of Wellington. The need for Sunday assemblies in the absence of a priest would therefore apply only to a few and/or remote pastoral areas in the archdiocese. It may be that there are occasional emergencies in a parish and finding a supply priest is difficult. Even then priests and lay leaders are to contact me as the archbishop for permission. No parish or pastoral area is to plan for a Sunday celebration without a priest as a matter of course. If it is thought that this is necessary in a remote pastoral area of the archdiocese I, as your bishop, need to be consulted first. I will then carry out the appropriate consultation with the council of priests before permission is given. I want the spiritual life of each member of the diocese to be nurtured. This is principally done when the community of the faithful gather on Sunday to celebrate Mass. From the days of the first Christian communities, the Mass has been the centre of our corporate worship. In these days of challenge and transition, I want every one to make certain that this central truth is not overshadowed or lost. May the risen Lord in the Eucharist continue to be the centre of our lives.